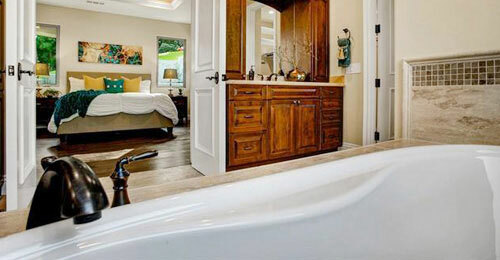 Velarde Builders provides comprehensive bathroom remodeling services throughout San Diego County. As a preferred general contractor for clients in Chula Vista, El Cajon, La Mesa, Santee, Carlsbad, Del Mar, Solana Beach, Cardiff, Encinitas, Poway, and other nearby cities, we’ve remodeled hundreds of bathrooms in a diverse array of styles. Our highly trained professionals average 20 years of experience and complete all work to the industry’s highest standards. We provide personalized service and handle each project from start to finish, including, planning, permitting, selecting and ordering materials, demolition, plumbing, electrical wiring, installation of fixtures, and finishing. Whether you wish for a simple, modern update or an expansive transformation, our bathroom renovation services will be tailored to your unique needs. Our commitment to beautiful, lasting craftsmanship, honest pricing, and exceptional results have made us San Diego’s trusted choice for bathroom remodels. We build with knowledge and expertise, and regularly work with architects and designers on both large-scale and luxury bathroom remodels. As former property investors, we know how to help you get the best return on your investment and choose styles that are popular and timeless. Throughout your project, we’ll also provide expert guidance, detailed project management, and continuous communication. Our goal is to help you realize your vision, optimize your budget, and ensure your project starts and ends on time. We also construct new bathroom additions to expand or upgrade your home or commercial property. Contact Velarde Builders, Inc. today to schedule a professional in-home consultation. We are a fully licensed and insured bathroom remodeling contractor with an A+ rating from the Better Business Bureau. We provide professional, expert consultations to residential and commercial clients throughout San Diego County. Why Choose Velarde Builders, Inc.
As an Real Estate Agent, I have many transactions where we use contractors for repairs. I utilized Velarde Builders to do work on one of . . .